Iris and I went to visit her aunt who lives in the apartment where Iris lived until she was 11. 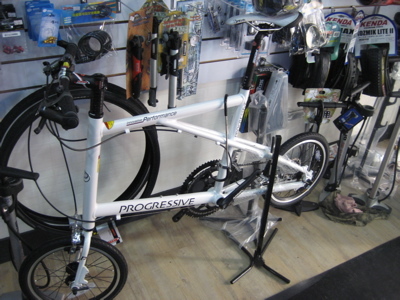 Just a couple blocks from the address, tucked in on a small alley, was a little bike shop with a showroom smaller than a American SUV. Despite its size and rather low key shop face, it was chock-a-block full with cool bikes. 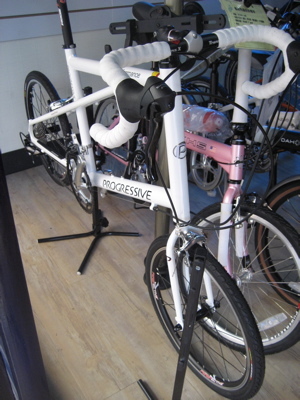 First thing to grab my attention was a bike by Progressive, a Japan-based company that offers a number of mini velo bikes with 16” wheels. They look pretty wild, especially the models with disc brakes on those tiny wheels. 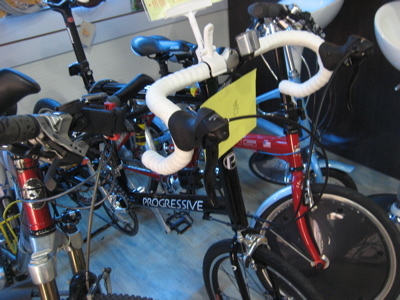 They also had a mini-wheeled version of the Pedersen, a Pinarello Prince with Campag Chorus, and a set of $3,500 Lightweight wheels. I still don’t know what to think of that shop…crazy inventory.